After three diggings and two cover crops, the soil can be shaped into permanent beds for long-term improvement, and you can grow undemanding crops like lettuce or bush beans. The overgrown garden is officially restored. The best thing to do with woody debris is to chip it, and renting a chipper may be worthwhile if you have a lot of slender saplings on your hands. Wood chips are my favorite material for paving around the composter and other mud-prone areas, and they are great for mulching blueberries and other plants that like acidic soil. As for prickly brambles, I usually resort to partially burning them using a method that turns them into charcoal, or what some people might call biochar or agricultural charcoal. First I enlarge a hole already made from digging out say, a blackberry/burdock duo, and then pile some accumulated debris in the hole and set it on fire (under legally permissible conditions, or course). 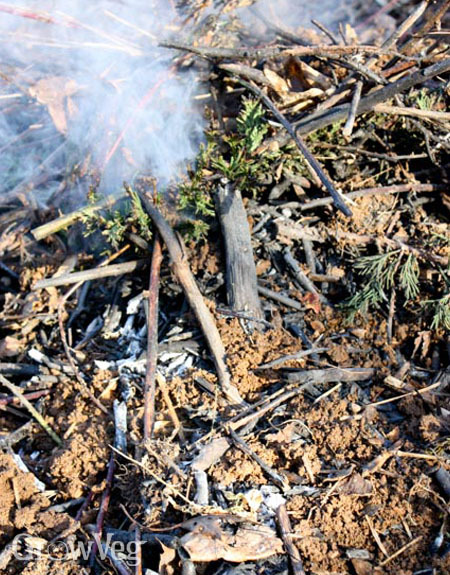 Then more debris goes on, and just when the fire really gets going I snuff it with soil, leaving the material to smolder. The fast fire leaves the half-burned bits and pieces riddled with holes, which makes them wonderful habitats for soil biota that work best with shelter, oxygen, and carbon together in one place. It's the best way I've found to turn thorny old blackberry canes into something good for my garden.